We decided to spend a relaxed New Year's Eve at home, with a movie, a bottle of wine, and a home-cooked Moroccan feast for two. What better opportunity to crack open some cookbooks I haven't yet used? Seeing as my partner has re-started the South Beach Diet and I'm doing my own low-glycemic food thang, the first book I went to was Eat Well Feel Well by Kendall Conrad. This is a book of recipes that comply with the Specific Carbohydrate Diet. One of the perks of being a food blogger is having publishers send you new cookbooks to look at. Unfortunately I am way behind on cookbook reviews, so many months after receiving this book from Clarkson Potter Publishers, I'm finally getting around to using it, perusing it, and sharing my feedback here. I was won over by the beautiful color photographs in the center of the book. I must admit I have a serious aversion to cookbooks that don't have full-color photos, so the photo section of this book was a real plus. The Specific Carbohydrate Diet is used to treat sensitive tummies as well as guts that have been damaged by Crohn's disease, ulcerative colitis, celiac disease, irritable bowel syndrome, diverticulities, etc. Celiacs and gluten intolerant folks who eat a strictly gluten-free diet usually find that their guts eventually heal and are generally able to tolerate any non-gluten foods after the healing period is over. However, many of us have multiple food allergies or other digestive disorders. Others find that they continue to be sensitive to a variety of foods and have trouble with digestion long after they are gluten-free, due to damage to their digestive tract. A small number of people find that they simply cannot digest grains at all, and that non-gluten grains make them almost as ill as gluten-containing grains. This cookbook is based on the diet described in the book Breaking the Vicious Cycle: Intestinal Healing Through Diet by Elaine Gottschall, which is the bible of the Specific Carbohydrate Diet (SCD). The diet eliminates "virtually all starch and complex sugars" and features a balance of "smart carbohydrates, good proteins and fats, and essential vitamins and minerals." It is grain-free. No unfermented / un-aged dairy products are allowed so the diet is lighter on dairy than most. This way of eating has helped many people recover from life-threatening digestive disorders. The difficulty of digesting grains has been explored in other books over the years, such as Against the Grain by Melissa Smith. I don't personally feel a need to eat this way, but many if not most of these recipes are also low-glycemic and low-carbohydrate and therefore fit well into my household's meal plans. Best of all they don't reflect deprivation, but rather an enjoyment of the plentiful healthy gut-friendly foods available at the farmer's market or grocery store. There are grain-free recipes for everything from grain-free Cashew Butter Tortillas to Peach Pocket Pies, and from Shepherd's Pie with Mashed Cauliflower to Tom Yum Kai with Coconut Milk & Lemongrass Infusion. Tonight I tried my first recipe from the book, which was Moroccan Cauliflower. While it was the photo that first caught my eye, I was also intrigued by the unusual (or at least new to me) method used for cooking cauliflower. Although my favorite method for cooking cauliflower is roasting it, I think this will be my new cauliflower technique for when times is short or I'm trying to reduce the fat in a dish. By steaming the entire head of cauliflower without cutting it first, it avoids all the wasted little cauliflower bits that litter the cutting board when you try to cut a raw cauliflower into florets, because it's far easier and neater to slice a whole head of cauliflower when it's cooked. The presentation of this dish is lovely, and it might even convince one of those notorious cauliflower haters to reconsider. Here is my adaptation of the recipe from Eat Well Feel Well. I hope you enjoy it, and have a fabulous, healthy and safe New Year! Adapted from Eat Well Feel Well by Kendall Conrad. 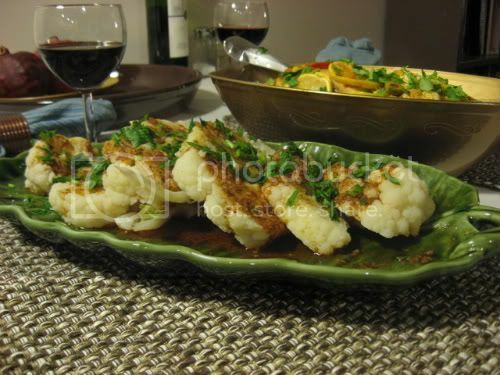 Trim the stalk of the cauliflower to the base, removing all leaves except the smaller green leaves closest to the head. Fill a pot with half an inch of water, place whole head of cauliflower in it (stem side down), and cover with a lid. Simmer on medium heat for 10-20 minutes (will vary depending on size of head, I had to simmer a medium head for about 15) until the desired tenderness. Remove from pot immediately, transferring to a cutting board or serving platter. While cooking the cauliflower, whisk together the oil, lemon juice, garlic, salt and pepper. Lightly toast the ginger, paprika, cumin and cinnamon over medium-low heat in a small pan for 3-5 minutes or until fragrant. Remove from heat and whisk into the liquid mixture, combining thoroughly. Cut the cauliflower in 1/2-inch thick slices, transfer to a serving platter and drizzle all of the spiced oil over the slices. Sprinkle with the chopped parsley and serve hot or warm. NOTE: Some of the links in this post are affiliate links, which means if you click through the link and purchase something from the site I will receive a small commission that helps me pay for the costs incurred from running this website. Gluten-Free Chanukah Recipe Roundup: Latkes, Sufganiot (Jelly Donuts) and More! Are you looking for gluten-free Chanukah recipes? You can see last year's Chanukah recipe roundup here. I thought I'd do an updated roundup with some links to a bunch of gluten-free Chanukah recipes to help you enjoy a delicious holiday. Some are mine and some are other folks' recipes. Chanukah foods are traditionally fried in oil and/or contain dairy, but there are as many different variations as there are ways to spell Chanukah / Hannukah / Hanukkah / Hanuka. I've tried to provide links that are varied enough that most folks can find something they'll be able to eat and will enjoy. Chanukah sameach! Remember you can always find my Jewish holiday recipes by clicking here or on the "Jewish recipes" tag on the sidebar at left. Seamaiden of the vegetarian gluten-free blog Book of Yum is hosting another round of Adopt a Gluten-Free Blogger, a blogging event in which we adopt another GF blogger and prepare one of their recipes. Last time I participated in this event, I baked gluten-free pita bread. This time it's the "Thanksgiving Edition" so we were all asked to prepare a dish from another blog that was thematically appropriate. 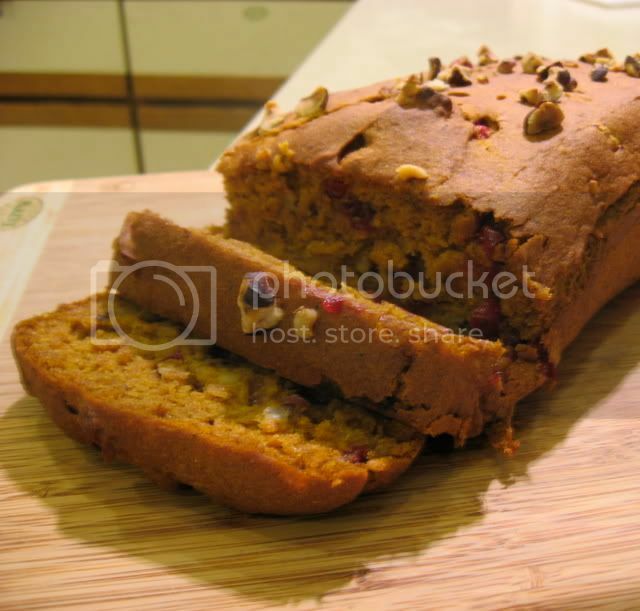 I chose to prepare the vegan, gluten-free Pumpkin Chai Bread with Cranberries from the blog Karina's Kitchen (a/k/a The Gluten-Free Goddess). Karina has long been one of my favorite bloggers. She has supported and inspired me ever since I entered the blogging world several years back. When she got diagnosed with a huge list of food allergies in addition to celiac disease, the gluten-free blogging showed their support for her in the Cooking for Karina event I hosted. They made it clear with their numerous submissions that she is one of the best-loved residents of the gluten-free (and food allergy) blogosphere. But I have to make an embarrassing confession: Though I've used Karina's recipes often to inspire my own cooking, I don't think I've ever truly and thoroughly followed one of her recipes! Until today, that is. I chose this recipe in order to use up the cranberries left over from canning cranberry applesauce a few weeks ago and to stretch myself by actually following a recipe for a change. I was a little worried about what the texture would be like, because the recipe is eggless and I haven't done a whole lot of vegan baking since being gluten-free. Thanks to egg replacer and xanthan gum it actually holds together pretty well. It is beautiful when it comes out of the oven - It is golden in hue and the cranberries look like gems! I enjoyed it, and look forward to toasting a slice or two for breakfast in the morning. Do I lose points if I smear a little butter on your vegan recipe, Karina? Hehe. The down-low on how I customized the recipe: I chose to use chopped hazelnuts as a mix-in in addition to cranberries, as they were on sale at the store (I initially wanted pecans, but they were twice as expensive). That was a good choice, because the ones I sprinkled on the top of the loaf before baking became lightly toasted which brought out their flavor and crunch. I used raw agave nectar instead of sugar (per Karina's suggested measurements). I would probably use a good bit more sweetener next time. I don't have a major sweet tooth but I think a little more sweetness would round out the flavor. I'd also cut down on the liquid a little bit more than I did, to compensate for the moisture from the agave. I baked it for 60+ minutes and it was still a bit too moist inside. The flours I used were 3/4 cup of millet flour, 1/2 cup sorghum flour, and 1/4 cup tapioca flour. This bread has a really nice texture with little bursts of tart cranberry flavor. It is lightly sweet which is great for those of us who don't have huge sweet tooths or are trying to cut back on sugar. It has a subtle chai flavor and the pumpkin is present but not overly assertive so this might be a way to get some more veggies into your kids' tummies! It's easy to make successfully using mostly whole grains, which was a plus. If you haven't checked out Karina's Kitchen, you've been missing out. It's worth subscribing to Karina's blog for the photographs alone! Stop by and congratulate her for just publishing Aftertaste in Exile, her book of paintings, poetry and photography. Did you know that you can connect with me, with this blog, and with other Gluten-Free Bay readers via the wonderful world of Facebook? So, come join in the fun! You can declare yourself a fan of Gluten-Free Bay here which will allow you to talk with other Gluten-Free Bay readers as well as have a pretty little picture and link show up on your profile if you so choose. This is a great way to show your friends what blogs you're a fan of. 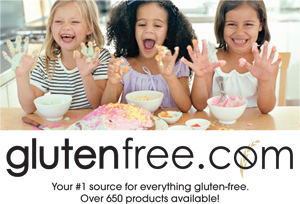 You can also join Gluten-Free Bay's blog network here. Soon people who join my blog network will be able to see my new posts right on Facebook. I would be thrilled to connect with more of you via Facebook, so if you're on there, let me know who you are by following one of the links above. This shabbos, I finally found one of the holy grails of kosher gluten-free cooking - A fantastic gluten-free cholent. I crafted this Ashkenazi/Sephardi fusion cholent by accident, really. Cholent is a stew that cooks slowly in a crockpot during Shabbos (the Jewish sabbath, during which observant Jews do not light or extinguish fires or electricity) without being stirred or having the heat adjusted in any way. It's the ultimate in low-maintenance cooking, since you just add a bunch of ingredients to the crockpot and let them cook overnight with no interference. People who've never tried slow cooking in a crockpot might think that all the ingredients would be mush after so much cooking - Strangely enough, vegetables tend to retain their shape and stay fairly firm during crockpot cooking. The meat, which should preferably be from a tougher cut (tough cuts do best with slow cooking in liquid), will become deliciously tender and fall apart when you stick your fork into it. Ashkenazi cholent is usually made with barley or wheat berries, neither of which people with celiac disease or gluten intolerance can eat. But you won't miss the grains with this cholent, as it's unbelievably flavorful and has a variety of textures. The Sephardi influence on this dish is the use of spices and flavorings that you wouldn't normally find in an Ashkenazi cholent (paprika, lots of garlic, turmeric), as well as the optional addition of whole in-the-shell eggs which become hardboiled over the course of the slow-cooking process. This is a little more decadent and a little more healthy than your average cholent. It wouldn't be an exaggeration to say that this dish has completely changed my conception of cholent. It's heavy but doesn't sit in your stomach like a rock, as some cholent does. My partner is a cholent-eating afficionado and she gave this one two thumbs up. I sauteed the meat to brown it about 1/2 hour before candlelighting on Friday (a little before 7) and then transferred it, along with all the other ingredients, to the crockpot. My crockpot (pictured above) automatically switches to its warm setting as soon as the cooking time you set it for is done - So at about 7 in the morning on Saturday it switched over, and we ate it at 12:30 PM. It was hot, and perfectly cooked. We ate the leftovers for lunch today and my partner mentioned that this was the first time she'd had the desire to eat leftover cholent. But then again, this is no ordinary cholent! A little disclaimer: I call for "powdered gluten-free onion soup, vegetable or chicken soup mix." Most kosher soup mixes have MSG in them. That's part of what makes them so tasty. I generally refuse to purchase or consume anything with MSG. But this is my exception. It's my little vice, I guess. If you must avoid MSG at all costs, you can use a couple of gluten-free MSG-free bouillon cubes instead. I've found a kosher, gluten-free brand called Bloch's Best that has no MSG. It's imported from Europe - I found it at Natural Spot in Teaneck. They won't be quite as flavorful as the mixes with MSG, so if you like you can use more salt and more spices and a little more white wine to make up for it. If you don't have a slow-cooker you can still make this dish - Bring the ingredients to a boil, reduce to a simmer, then right before shabbos cover the pot very tightly and either simmer over a low flame all night, or have it cook in the oven on a low setting. I will be happy if thise recipe helps just one other gluten-free Jew have more joyful and delicious shabbos... and even happier if some non-Jews and/or non-celiacs will discover this as a new way to prepare a filling one-pot meal. In a pan, or in the ceramic liner of your crockpot (if it's the type that can be removed from the element and used like a pot on the stove) heat 1 Tbsp vegetable oil over medium heat. Add onions and sautee for 2-3 minutes. Add meat and cook only until browned on the outside. Move onion and meat mixture into the crockpot (or move your ceramic liner back onto the heating element of the crockpot). Set it so that it will cook on low for 12 hours and then switch to its warm setting. Add dry (unsoaked) beans, then potatoes. Add all of the rest of the ingredients except for the eggs, distributing ingredients as evenly as possible. Make sure the meat won't touch the lid of the crockpot. Nestle eggs carefully on top of other ingredients. Pour water into the crockpot until it covers everything. Put the lid on, making sure it fits securely so that steam doesn't escape (use a layer of tin foil underneath if necessary). Do not stir the cholent until you are ready to eat it, at which point you can remove the eggs so that you don't crack their shells, and stir it VERY gently. Serve in bowls, topped with the now-hardboiled eggs (if you included them). If you've warmed your favorite gluten-free bread or challah on the top of the crockpot you can use it to sop up the stew. NOTE: This recipe is for a 6-quart crockpot. 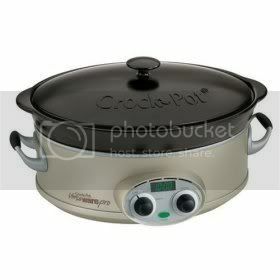 For a smaller crockpot, reduce all the quantities slightly. No exact measurements are necessary for this recipe. Cabbage Salad with Lime and Fresh Oregano, and a side of Big News! Our new apartment is coming together slowly but surely. Merging two people and all their respective stuff into one apartment and a shared life is quite a project. I am loving living in a spacious apartment with hardwood floors and walls painted lovely colors. I am also really digging the endless cabinet and counter space in our new kitchen (still unpainted and far from ready for a photo op!) New Jersey life is treating me pretty well, considering how ill-suited I am to suburbia. I got accepted to the school I applied to, to become a Nutrition & Food Science major with a concentration in Dietetics! It's an ADA-approved program to set me on track to becoming, G-d willing, a Registered Dietitian. I am pretty darn scared but also very excited. Gonna be a full-time student for the first time in many years. It'll be an intense few years 'til I finish my degree, let me tell you. Anatomy & physiology, organic chemistry and microbiology, oh my. It was 96 degrees today and our air conditioner is/was broken. It's been repaired but is taking a long time to get our second-floor-and-right-above-a-pizza-place apartment back to a bearable temperature. So I decided to do minimal cooking. Ground turkey tacos on corn tortillas, with black beans, homemade salsa fresca, fresh guacamole and dairy-free/pareve sour cream (Tofutti, since there's no time to make it from scratch). A delicious looking Rioja wine from the fantastic kosher wine section at the ShopRite liquor store in Englewood. Cabbage salad made from the hugest cabbage I've ever seen. Nothing fancy. For tomorrow's lunch we'll have salad with quinoa topped with roasted beets and carrots, and some feta cheese. 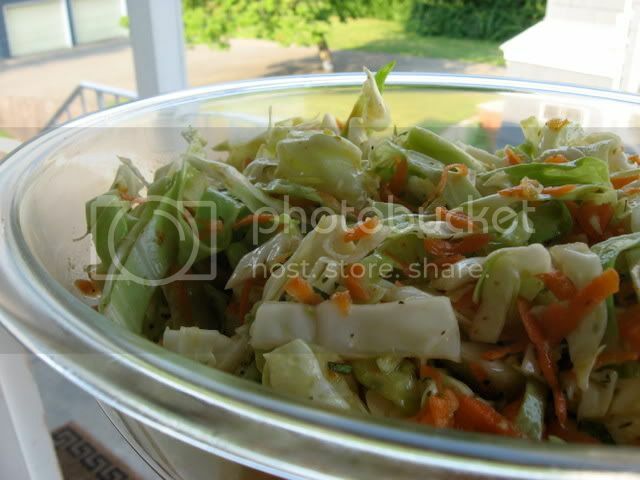 Here's a recipe for the cabbage salad I made. It's a quick, light, no-cooking recipe with lots of flavor. A great crunchy topping for tacos or a side dish for any meal, especially a spicy summer meal. It's not so different from the curtido de repollo I posted as a topping for homemade pupusas, but I made some alterations that give it its own crunchy identity. Like most cabbage salads, it should get tastier by the day so I made enough that my partner will be able to take some with her to work on Monday for lunch. The picture above is of the cabbage I used, which is the biggest cabbage I've ever seen. I picked up for $1.50 at the Englewood Farmer's Market today from a local farmer. Good grief, this thing is huge! 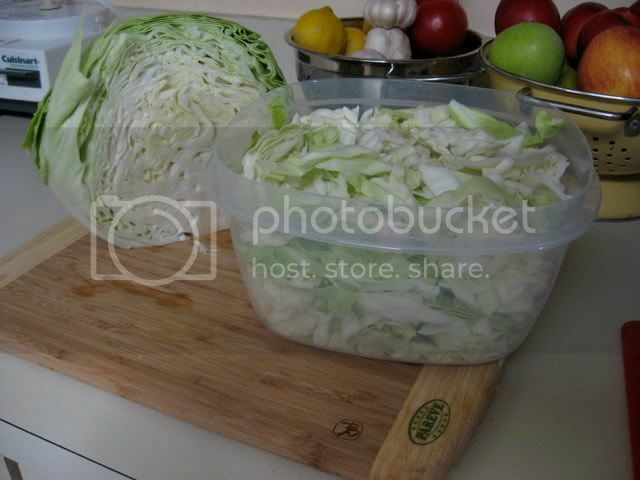 I don't know if the picture really conveys its hugeness, but I took this pic to show how half the cabbage filled up the biggest, gigantic-est tupperware we have. It was about twice the size of my head, and will easily feed us for two weeks. To be realistic, I've called for one medium cabbage in this recipe, even though in my case it was really 1/2 a mutant cabbage. Mix all liquid ingredients and spices (except fresh oregano) in a small container. 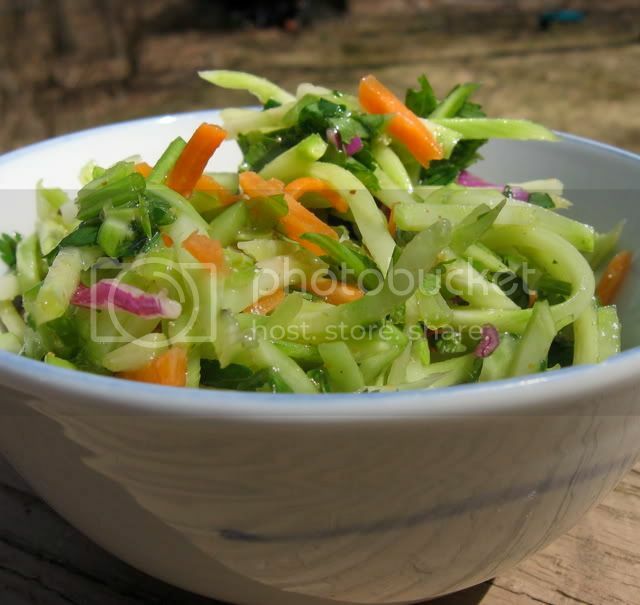 In a large bowl, combine cabbage, carrots, and oregano. Drizzle the liquid/spice combination on top of the vegetables, mixing frequently. Cover and refrigerate for 2-4 hours before serving cold or at room temperature. 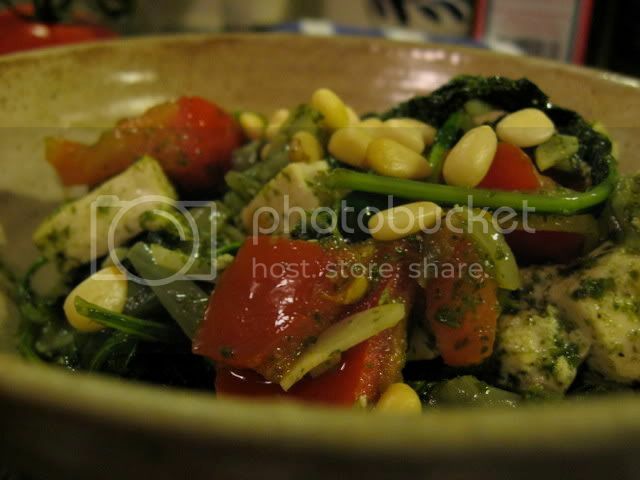 It's tofu, kale and tomatoes with parsley pesto and pine nuts. I will post the recipe at some point, but not at this moment because I'm a bit overwhelmed. I am in the middle of moving... to New Jersey. I am shacking up with my love. More on this later. I will have my own kitchen again - And some free time this summer. A good recipe for more food blogging, perhaps? What are you cooking with harvest from your own gardens, or from farmers' market bounty? Dear friends, I am so very sorry that I have not had the time to do a real 2008 redux of the Great Gluten-Free Passover Roundup of 2007. Though I'm happy to say, last year's post is still every bit as relevant this year. Recipes don't age into oblivion like so many things in our world do, gratefully. Since I don't want to let the days slip into Passover without pointing new visitors in the direction of some gluten-free Pesach resources, I thought I'd quickly throw together a list of links that I hope will be helpful to new and old readers alike. If you are not Jewish and are gluten-free... Good grief, people, what are you waiting for? Get thee to a kosher grocery store! This is the time of year to stock up on gluten-free delicacies, from blintzes (I have two packages in my freezer and can't wait to try them) to croutons to seven-layer cakes. Specifically, look for the label "non-gebrokts" to find products not made with matzo meal, and if a non-gebrokts product isn't also marked gluten-free (or even if it is) contact the company to verify gluten-free status to avoid potential cross-contamination from products made with matzo on the same line. The days after Passover are often a good time to get these items on sale, too. I hope next year I will have more time and less stress around the holidays and be able to wow you with some new recipes, but for the time being, have a healthy and happy Passover. My Passover Recipes - Recipes from this blog that can are kosher for Pesach or can be made suitable for Pesach (ssome may require minor ingredient substitutions, but most don't). Includes mock matzo, non-gebrokts Passover noodle kugel, matzo balls, and more. 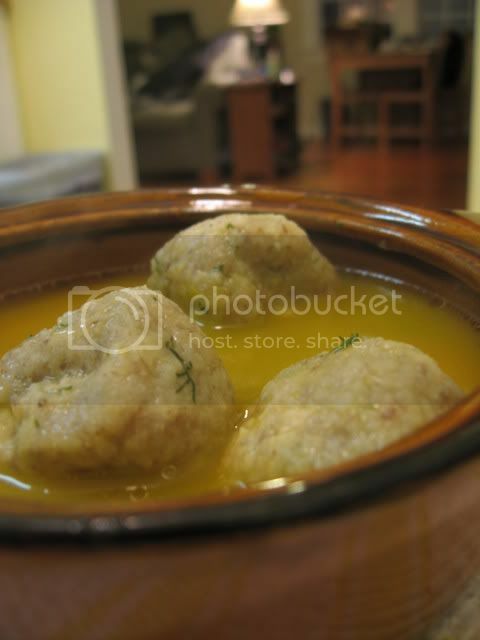 New GF Pesach Recipes from Ellen - Including a new matzo ball recipe that sounds great. A Gluten-Free Paradise - Gluten-Free NYC shows photos of why Passover is, indeed, a "gluten-free goldmine"
Gluten-Free Oat Matzo - Where to buy it. By now it is probably too late to order it, but you can still find it in many kosher groceries. I can tell you first-hand it was flying off the shelves at Rockland Kosher (Monsey, NY) and Glatt Express (Teaneck, NJ)! Quinoa: The Grain That's Not - Kashrut.com explains why many rabbis consider quinoa acceptable for Passover. Note that Kosher Overseers determined that Ancient Harvest and Trader Joes' brands are kosher l'pesach without a special Passover hechsher as long as they are in closed boxes. Passover By Design - Susie Fishbein's newest book has sold out nearly overnight at many stores and features over 130 gluten-free recipes for Passover and year-round. Mmm... Nothing like a brightly colored, fresh, raw vegetable salad to celebrate the first daffodils popping up in the garden. I plan to make this recipe for Passover, since it's so incredibly fast to whip up large amounts of and is good with nearly every meal. It's also a welcome burst of color and flavor in a holiday that (in many houses but not mine!) tends to be dominated by dense, heavy, potato-focused Ashkenazi fare. This is a super-quick, no-cook, minimal-chopping dish that can be served as a side for Mexican or other Central American cuisines, as a topping on a green salad, or alongside fish or grilled chicken. It's perfect for warm weather, when cooking is the last thing you want to do. I think this will also be a good stand-by for shabbat. 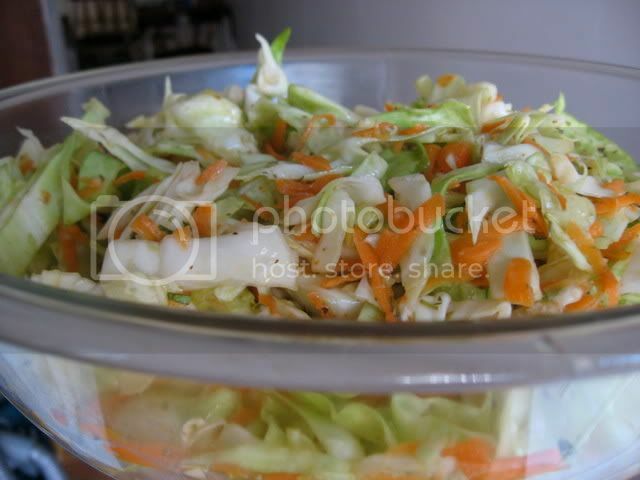 This is hardly a coleslaw (yuck, I hate coleslaw) but it's made with what is often called "broccoli coleslaw mix". You can find it in most American supermarkets I've been in, with the bags of salad and shredded cabbage. It usually contains shredded broccoli and carrots, and sometimes cabbage as well. If you can't find the kind with cabbage in it, try shredding a little purple cabbage in yourself - It's worth it for the color alone. I don't bother putting in the measurements for this recipe, which I am usually fairly consistent in doing, because it's really an intuitive recipe that's best done by seasoning it to suit your own tastes. Add ingredients little by little, mix well, and taste before further seasoning. Remember that overnight while it sits in the fridge, the vegetables will absorb the flavors fully. So dress it lightly, and don't overdo it on the spices or the lime juice - Subtlety works well with for this salad. It's a perfect showcase for that bottle of very high quality extra-virgin olive oil you've been saving in the back of your pantry... or is it just me who saves such things for "a special occasion" that never comes? Mix all ingredients in a large bowl. Taste and adjust seasonings. Allow to sit overnight before serving, for optimal flavor. Can stay in refrigerator for several days. For the Adopt-a-Gluten-Free-Blogger event, it was only natural that I'd choose to adopt Naomi Devlin of Straight Into Bed Cakefree and Dried. Naomi is a homeopath, mom, and baker from the UK. Her approach to cooking and baking feels familiar to me, because it's similar in many ways to mine. She is one of the bloggers whose recipes resonate with me the most, in her use of whole-grain gluten-free flours and nut meals, her adventurous exploration of new flavor combinations and textures, and her preference for natural sweeteners and nutritious ingredients. I love reading the blogs of cooks who are more likely to post an innovative and healthy recipe that introduces me to new flavors and textures than a recipe that's yet another nutritionally empty gluten-free clone of the usual standard American (or Western European) fare. I rarely bake these days for a variety of reasons, but Naomi's pita recipes were too tempting to pass up. 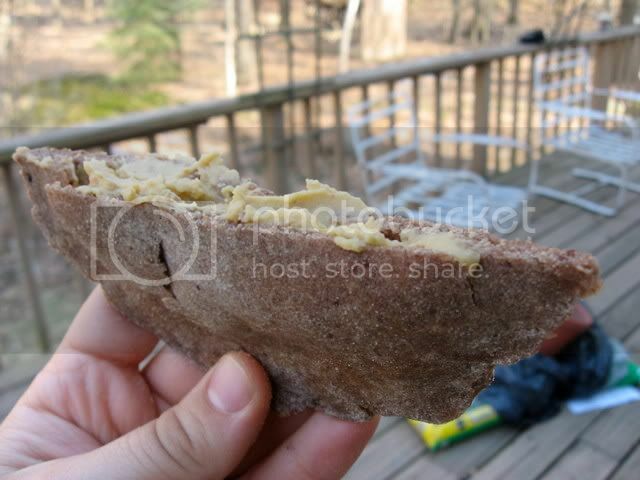 I made Naomi's recipe for Teff Pita Breads. Though I've had gluten-free falafel, I haven't had a pita bread since stopping eating gluten. It was such a thrill to take these out of the oven and see that they had, indeed, puffed up into pocket breads! (Well, about half of them did at least). They were tasty as can be, especially straight out of the oven. Over this past week I've eaten them stuffed them with hummus, with cheddar cheese, and with peanut butter, bananas and a drizzle of local honey. They were fantastic every which way. Thanks for sharing your terrific recipes with the gluten-free blogosphere, Naomi! When the Mid-Hudson Valley Gluten-Free Outings Group had our Valentine's Day Gluten-Free Cookie Swap back in February, I encouraged members to consider making a recipe that would accommodate people with food restrictions beyond just celiac disease or gluten intolerance. So I decided to take upon myself the project of creating a gluten-free sugar-free cookie. I'm not usually a big fan of Splenda but I figured I'd give it another shot - At least my mother, who was doing the South Beach Diet, would eat the cookies, right? My other hope was that I'd figure out a way to finally make a macaroon that I'd like and that I could make with little to no sugar for when Passover rolled around. Well Passover is nearly here. Splenda is NOT kosher for Passover except in its industrial version. However, I think these cookies would taste just fine with another dry alternative sweetener such as granulated fructose, artifical sweetener (not my preference), certain sugar alcohols, maple sugar... whatever you can find that's kosher for Passover -- I'm not sure what's on the market because I don't plan on eating many sweets this Passover. Of course, if you eat sugar, you can save yourself the trouble by making this recipe with plain old white sugar. I have cut the Splenda amount in this recipe from the amount I used when I originally baked these, since I found them too sweet. Coconut and pecans have their own sweetness to them and I wanted their flavor stand out in all its glory. 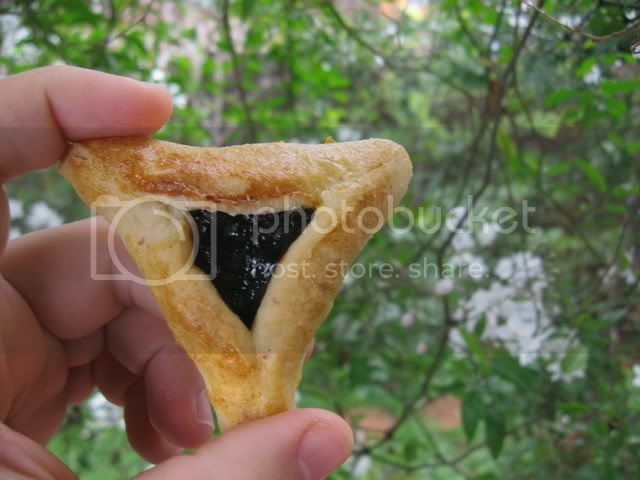 In fact, I'm even considering making these for Passover without any sweetener at all! This was my first time trying pecan and coconut flavors combined, and I discovered I love this duo! 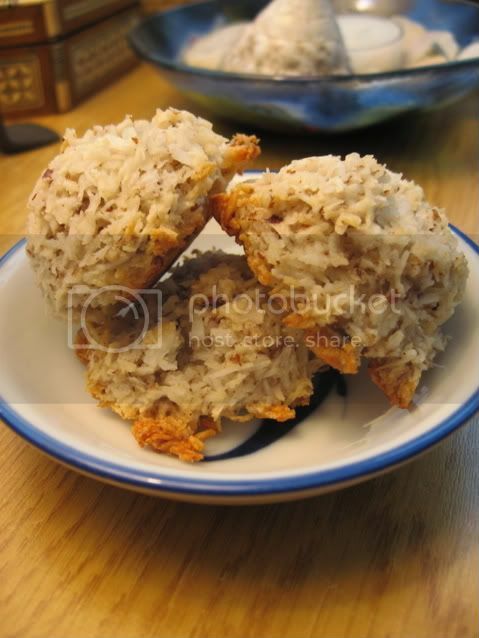 Better, in fact, than the traditional almond-coconut macaroon combo. I'm not sure if there is a kosher l'pesach brand of ground pecans, but you can always buy some pecans and pulse them in a food processor (or little by little in a coffee grinder) until they have a relatively fine, sandy consistency. Voila, pecan flour! Preheat oven to 325 F. In a large mixing bowl, whip the egg whites, salt and vanilla until frothy with an electric mixer. Slowly pour in the Splenda or other dry sweetener. Whip until stiff peaks form. Gently fold in the ground pecan and coconut gently. Do not over-stir - Batter should remain frothy. Line a cookie sheet with parchment paper. Use a tablespoon measure to drop rounded tablespoons of batter onto the paper 1/2 inch apart. Remember that they won't rise or expand! Bake for about 20 minutes, or until golden brown around the edges (let them get a little browner than in this photo!). Turn off the oven heat, open the oven door slightly, and let the macaroons sit in the oven until cool to keep them from becoming overly moist. *The Splenda available in retail stores is not kosher for Passover. I couldn't have been more thrilled when I got an e-mail from a gentleman from Lakewood Shmura Matzo Bakery in Lakewood, NJ, telling me his bakery was now producing certified gluten-free oat matzos right here in the United States. He graciously sent me two boxes of matzos to try out. The only source of gluten-free oat matzo I knew about before this was a company in the UK which makes a good product (and gluten-free matzo meal, too!) but is costly due to being imported. The Lakewood product is half the price of the British matzo ($20 for three matzot, as opposed to as much as $40 for three matzot). So this year I'll get to save my money for other Passover treats. 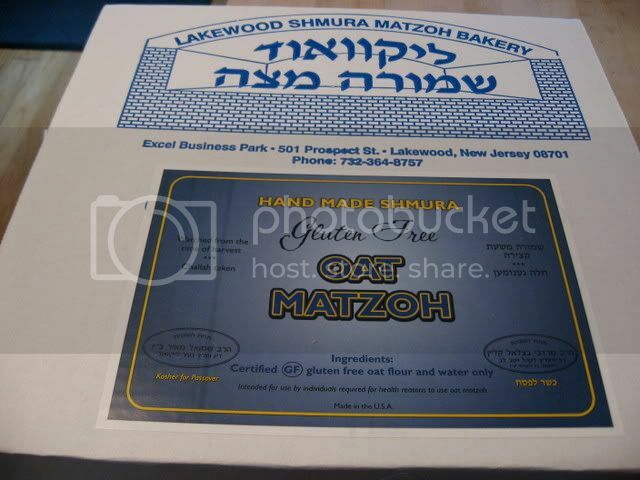 The matzo from Lakewood Shmura Matzo Bakery has a hechsher from Rabbis Katz and Klein, both of Lakewood. It is made of certified gluten-free oat flour. The final product was tested by the Food Allergy Research & Resource Program (FARRP) in Nebraska, and the bakery sent me a copy of the report from FARRP, which indicated that there is no detectable gluten in the product (the product was rated "BLD" or "below limit of detection") which means this product is reliably safe for celiacs. Please note, however, that there are some people with celiac disease who find they cannot digest oats at all. If you're wondering why gluten-free matzo is so expensive, let me explain. First, the oats have to be grown segregated from wheat and other gluten-containing grains. They have to be harvested and milled with separate equipment. Shmura matzo is handmade rather than made with machines. This is especially remarkable given the fact that matzo must be made within 18 minutes to be considered unleavened. In addition, a dough made of only oat flour is difficult to work with as it contains no gluten nor gluten substitutes. Of course, the entire process must be supervised to ensure the product is kosher... and not only kosher, but kosher for Passover - A much higher standard of kashrut. This is why shmura matzo is always expensive, and gluten-free shmura matzo even more so. The Lakewood matzo is good. The bakery suggests reheating the matzoh "in a very low oven for a few minutes before eating, it takes a lot of the moisture out." I second this recommendation, as the matzo can be a little stale coming right out of the box. It is definitely "the bread of oppression" - Probably not a cracker I'd nosh on just for the fun of it. However it is perfect for fulfilling the mitzvah of eating matzo on Passover and would taste fine heaped with charoset and maror (and you can grind up leftovers in a food processor to make matzo meal!) The matzos are thicker than a normal wheat matzo, which the bakery says is to make them less likely to break during shipping, so they're not as crisp as thinner matzos. There is something about the taste that definitely says "matzo" to me, which made me happy since it reminds me of when I could eat regular matzo. All in all, I can recommend these without reservation. I think they are certainly equal with the matzo from the UK. The Lakewood Shmura Matzo Bakery doesn't have a website, but you can order by faxing (732) 364-4250 with shipping and billing information. The product is $20.00 per box of 3 matzos, plus a flat $10.00 for shipping (I believe this cost covers as many boxes as you order). If you have questions call (732) 364-8757. The matzo is also available in many kosher grocery stores. Certified gluten-free oat shmura matzo. Available by mail order or in stores. Made in the United Kingdon but available at local distributors or from Kosher.com. Certified gluten-free oat shmura matzo, machine matzo and matzo meal available. No direct mail order on their website. 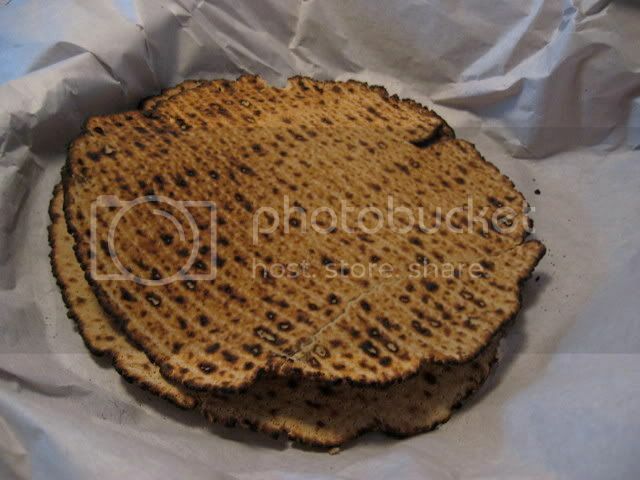 The mock matzo recipe above does not fulfill the mitzvah of eating matzo, as it is not made from one of the five grains specified by Jewish law. But it's still tasty! Remember, the widely available spelt matzo is NOT gluten-free. Spelt is a form of wheat and contains gluten, thus is not safe for people who are gluten-intolerant or have celiac disease. This is an easy and delicious creamy dessert that can be whipped up in minutes. Great for the sugar- and carb-conscious, but just as delicious for anyone who loves chocolate and peanut butter. Yum. Blend ingredients on medium speed in a blender until smooth, or use a fork to blend thoroughly until no lumps remain. Serve cold. Can be stored for 24 hours in the refrigerator. This post is admittedly a bit late (Purim starts Thursday night) but I've been in the Bay Area with my partner for the past week and a half doing anything but blogging. My own delicious recipe for cakey, no-refined-sugar gluten-free hamantaschen can be found here. I posted it last year around Purim and it's been a big hit. You can see reviews of the recipe on Recipezaar, too. I've become more strict about only using products with reliable kosher supervision, so I no longer use Pamela's Baking Mixes. However, Pamela's mix works amazingly in this recipe. If you are dairy-free, want the recipe to be pareve, or only use hekshered products, you should feel free to use another gluten-free baking mix of your choice. About.com's Celiac Disease page just published this recipe for hamantaschen that uses cream cheese in the dough. Looks like a tasty dairy option. Two other options are this recipe from the Jewish-Food listserve (adapted from a Chabad recipe) and these fascinating hamantaschen from Elana's Pantry, which are both grain-free and dairy-free. Nuts - Stick to the unflavored kinds unless you can verify they're gluten-free. A nice artisanal kosher cheese (anything but blue cheese should be safe). Have a wonderful and wild Purim! ...And if you're Jewish and have food allergies and/or gluten intolerance or other food restrictions, come join us on the AllergicJews listserve, where we discuss everything from the halacha (laws) of gluten-free challah to recipes for nut-free charoset. I thought I ought to give you all another installment of the Gluten-Free Recipe Roundup before I leave later this week for a 10-day vacation in the Bay Area with my sweetheart. I'm looking forward to returning to my old stomping grounds, showing my partner the wonder that is the produce section at Berkeley Bowl, perusing farmers' markets and enjoying 10 days without snow. Here are enough recipes to keep you cookin' for all 10 days that I'm gone... and then some! The Standard Disclaimer: As usual, there are recipes on here that call for ingredients that can be found in both gluten-free and gluten-laden versions (soy sauce, breadcrumbs, etc). There are also ingredients that are available in both kosher and non-kosher versions (and of course milchig and fleishig and pareve). I haven't checked over every ingredient list with a fine-toothed comb, so be sure to check labels, and be creative! And remember... one woman's side dish is another woman's entree. Click here for previous editions of the Gluten-Free Recipe Roundup. Edited to add: Yes, that's me in the picture - A blurry whir of sweet-potato-grating action. You might wonder why I would post a blurry picture of myself, but I actually love this photo because I'm moving so fast and working so hard that I'm a blur, yet the bowl of sweet potato latke batter is totally in focus! It's been a while since I did any product reviews and since I now have more of a readership of people who are both kosher and gluten-free I thought I'd start doing product reviews more regularly of products that have a hechsher (a kosher certification) and are also gluten-free. Everyone accepts different hechshers, so use your own judgment or consult your local halachic authority if you have questions. In addition, I'm hoping these product reviews will be just as useful for readers who are halal or vegetarian/vegan, or who are just plain ol' gluten-free and looking for some new GF products to try! Info for Special Diets: All gluten-free products are vegan and contain no dairy, no refined sugars, hydrogenated oils, cane or beet sugars, cholesterol or trans fats. Review: I wanted so much to like these cookies or at least find them edible. After all, there aren't that many products on the market that are reliably gluten-free, vegan, have no refined sugar and are reliably kosher. So I was terribly disappointed the second I bit into the No Gluten Cookie Bars - Berry Vanilla. They were incredibly grainy, had weird crunchy unidentifiable hard bits in them, and had a weird berry flavor but no actual pieces of berry. They were impossibly dry and I couldn't really taste any vanilla - But ultimately, I don't think there's any flavoring that could have countered the horrible, inedible grainy, crumbly texture. I couldn't bring myself to take more than two small bites, and when I had a friend take a bite they spit it out. The Nana's No Gluten Chocolate Cookie was more edible. 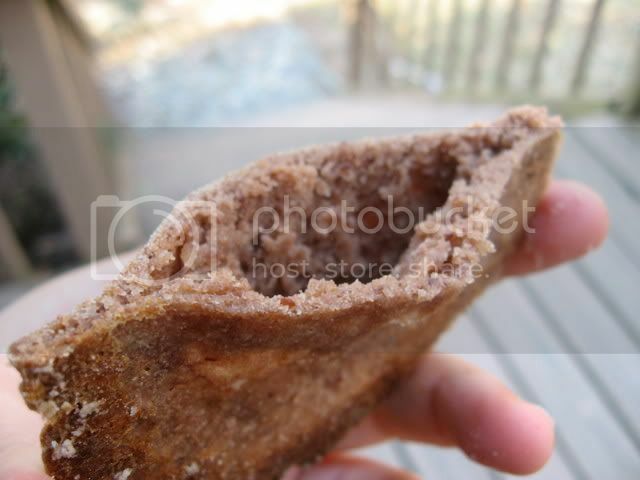 It was very, very mealy - It tastes like they use a coarse grain rice flour instead of a finely ground one. But it at least tasted pretty chocolatey. I can definitely a child enjoying this cookie. I didn't enjoy it and could only bring my chocoholic self to eat half of it, but it is a healthier option for parents with food-allergic kids they prefer not to feed sugar to. I hate giving bad reviews, but my conclusion about Nana's products is this: If these taste good to someone, I would guess it's because they have gotten use to substandard gluten-free products. Folks, you don't have to settle for low-quality products that don't taste like real cookies! If can make good gluten-free vegan cookies at home, why can't a professional baking company make an edible product? 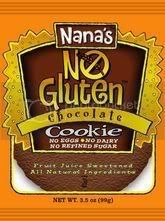 You can purchase Nana's No-Gluten Cookies here or at your local health food store or Whole Foods. Info for Special Diets: All products marked gluten-free. Vegan, pareve, no sugar. No visible nut or soy ingredients but I haven't been able to verify that their spice mixture is free of these allergens. Review: Who needs boring old rice pilaf when you can have all the flavor and texture of a pilaf combined with the unbeatable nutritional profile of quinoa, that legendary "supergrain" that's not really a grain at all? I took this photo at Kosherfest back in the fall. I discovered and tasted and photographed so many new kosher gluten-free foods, and then promptly neglected to ever do a comprehensive post about my discoveries. Oops. Then a few months ago I went to Rockland Kosher, a huge kosher grocery store in Monsey, NY. Among a bunch of gluten-free goodies I found there, they carried Pereg Quinoa Mixes, which I'd tasted at Kosherfest and loved but didn't think I'd find in any stores near me. I bought two different flavors - Quinoa Mix with Vegetables and Italian Style Quinoa Mix. They also make one with mushrooms. These quinoa mixes come in convenient plastic jars so they can be easily poured for measuring. They contain all natural ingredients, and of course are gluten-free. 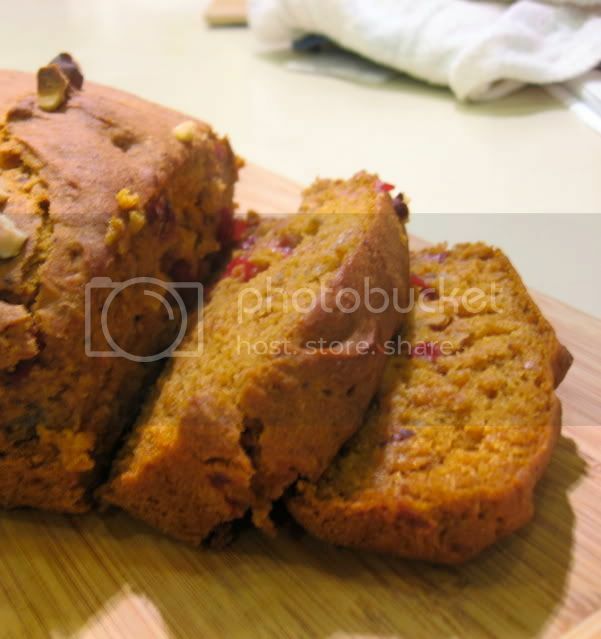 The ingredients include spices, raisins and dried vegetables - No MSG or preservatives. No rinsing is necessary, unlike with quinoa bought in bulk. Just follow the simple directions on the package and you end up with a fluffy and attractive quinoa pilaf that has a good amount of flavor to it. I love these mixes - Though I make my own quinoa pilafs from scratch, sometimes I just do not have the time to cook. I'm not a fan of plain steamed quinoa, so having a mix like this means I can have a flavorful side dish in a short amount of time without resorting to nutritionally-empty packaged white rice pilaf. I really enjoy these pilafs and am excited to see them on the American market. My only suggestion for improvement is that instead of following the directions on the package I recommend using vegetable or chicken stock in place of water, to add more flavor to the quinoa. I also recommend sauteing the quinoa in the oil for more than 20 seconds before adding the water. 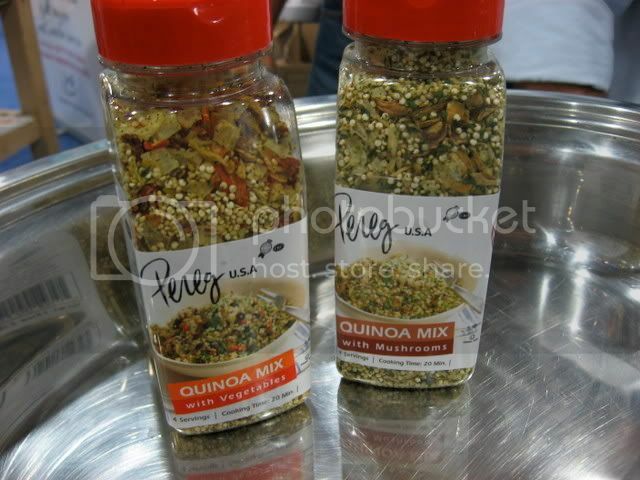 You can purchase Pereg Quinoa Mixes here or at your local kosher grocery. I've "adopted" Naomi of Straight Into Bed Cakefree and Dried for this month's Adopt-a-Gluten-Free-Blogger event, hosted by Sea of Book of Yum. You, too, can adopt a gluten-free food blogger of your very own! All it involves is heading over to Sea's page, reading the instructions and letting her know who you choose. Then you prepare a recipe or two from the blog you adopted, and post in your blog about your adopted blog, your adopted blogger, and the recipe/s you tried! A fun excuse to try another blogger's recipes, while getting some new folks to check out your own blog. Sea is hoping this event will become a monthly thing. It was perfect timing for me, because I was really looking for an excuse to try Naomi's pita bread recipe! I've been having quite a hankering for German potato salad - Specifically, my "famous" Herbed New Potato Salad with Green Beans. Unfortunately, potatoes are super high-glycemic and are not considered "good" carbohydrates, and thus are verboten on the South Beach Diet, any low-carbohydrate diet, and the Glycemic Index / low-gylcemic approach to eating. What's a serious potato lover to do? Cauliflower! I love cauliflower. I always have. Since eating a lower-glycemic diet I've been cooking my Lemon-Roasted Cauliflower with Dill and other roasted cauliflower recipes quite a bit. Another favorite cauliflower dish is my Aloo Gobi Mattar (Indian Potato, Cauliflower & Pea Curry) which I will also try making without potatoes one of these days. Simply by replacing new potatoes with small florets of cauliflower boiled until tender, I was able to re-make this recipe into something healthier, more nutrient-dense and dramatically lower carbohydrate, without compromising the taste. 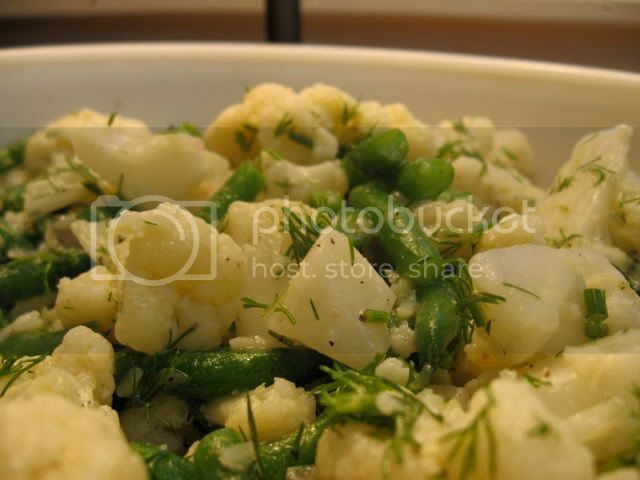 I loved this salad, and it was even better a day and two days later when the cauliflower and beans had absorbed more of the marinade overnight. I make a lot of salads and vegetable dishes that can be eaten cold on Shabbos since I don't cook on the sabbath. So I made this Friday to eat with my dinner, but also ate it for part of my lunch on Saturday. Heck, I even ate it for breakfast! Combine all ingredients except cauliflower and beans in a large bowl. Wash cauliflower well and cut into 1/2 inch pieces. Cover with water by several inches in a large pot, and add 2 Tbsp salt. 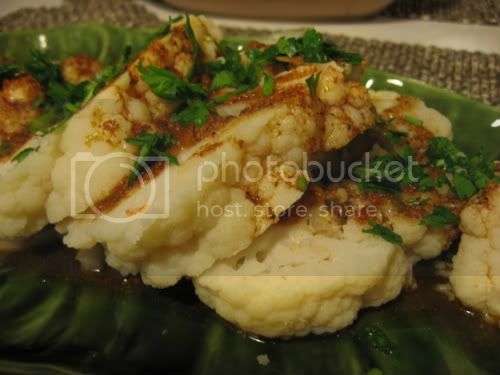 Bring to a boil, then reduce heat to medium-low and simmer until the cauliflower are tender without being mushy. Do not turn heat off, but transfer cauliflower into a colander immediately, and rinse with cold water several times. Allow to cool just until they are warm but can be comfortably handled. Turn the heat up under the pot of water and add green beans. Cook uncovered for just a few minutes, until green beans are tender but still crisp and bright. Remove from water and drain. If you want to retain the brightness of their color, submerge them immediately in ice-water until cooled. Add beans and cauliflower to the large bowl that contains dressing. Toss very gently to combine, stirring from the bottom to coat cauliflower and beans with the dressing. Allow to sit for 20 minutes before serving. Garnish with additional chopped herbs if desired. Serve while still warm, or at room temperature. This recipe is part of the Weekend Herb Blogging event, hosted this week by Swirling Notions. Martha Stewart's New Magazine for People with Food Allergies? It Could Happen! Each year Martha Stewart holds a competition for her employees where they get to pitch their ideas for the future of Martha Stewart Living Omnimedia. She narrowed it down to 7 and is allowing us (you!) to vote for the winner. One of the finalists' ideas is a cooking-oriented food allergy magazine. Alexis- Big Idea: To publish a special magazine that offers delicious allergy-friendly recipes, making life for people with food allergies and sensitivities easier and more delicious. Millions of people, including myself, can't eat nuts, dairy, wheat or gluten, and I’d like to empower people to make great recipes even if they can't use all the standard ingredients. You can vote once a day until February 7! The food allergy magazine concept currently has a narrow lead. I have been eating a lot of edamame. 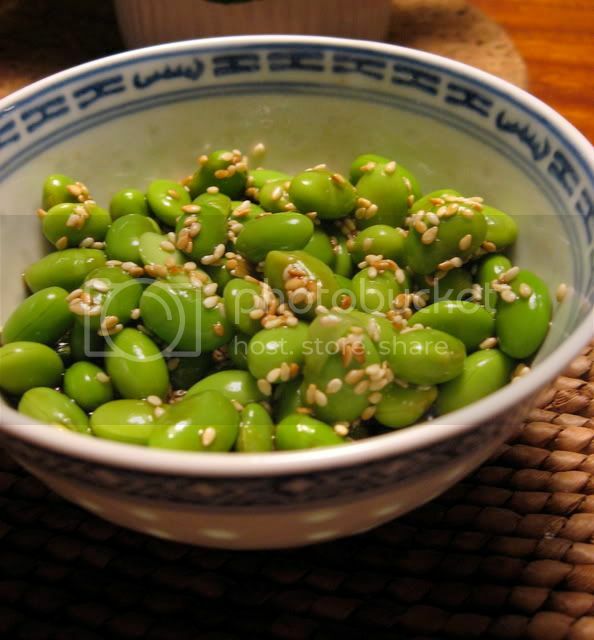 I don't normally eat a lot of soy, but edmame (steamed or boiled soy beans) are a favorite snack on the South Beach Diet (especially during Phase 1) because they contains fiber and protein and are easy to travel with. I was a little tired of eating edamame plain so I decided to turn these humble little beans into a simple side dish with more complex flavors. What I ended up with was a dish that would be a wonderful compliment to a chicken or tofu stirfry, miso-ginger grilled fish, or sashimi and brown rice, as well as other dishes that reflect the use of Chinese or Japanese seasonings. It can also be used as a condiment of sorts, to sprinkle over the top of fish or meat. This flavorful vegan salad is high in protein and fiber, and contains no added sugars. It is suitable as an appetizer as well as a side dish. I'm a big fan of the flavors and textures of this dish and I guess my mother is, too, because I had to keep swatting her hand away from the bowl. I can tell I will be making it again and again. I thought it would last me at least two meals, but I wolfed the whole bowl down. This recipe is easy to double if you're cooking for more than one or two people. Notes on ingredients: By the by, my partner discovered pre-shelled frozen edamame at her grocery store. It's made by Dr Praeger's, of all companies! 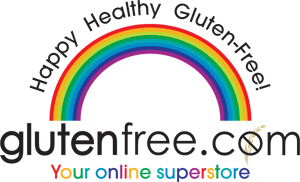 (They are a favorite for kosher gluten-free goodies such as fish sticks and potato pancakes) I have been unable to find them anywhere else, and they're not yet listed on their website, but check your health food store or kosher grocery for them. Next time I'll use these, as they'll spare me 10 minutes of squishing the beans out of their pods. As far as rice vinegar is concerned, the brand I prefer for this dish is Eden Foods Organic Brown Rice Vinegar. If the edamame you use are frozen, defrost them. 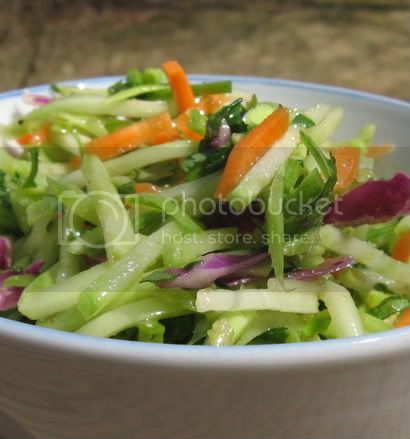 Mix in a small bowl with soy sauce, sesame oil and rice vinegar. Adjust sesame oil to taste. For stronger flavor, marinate overnight. In a pan over low heat, toast the sesame seeds just until they start to turn golden. 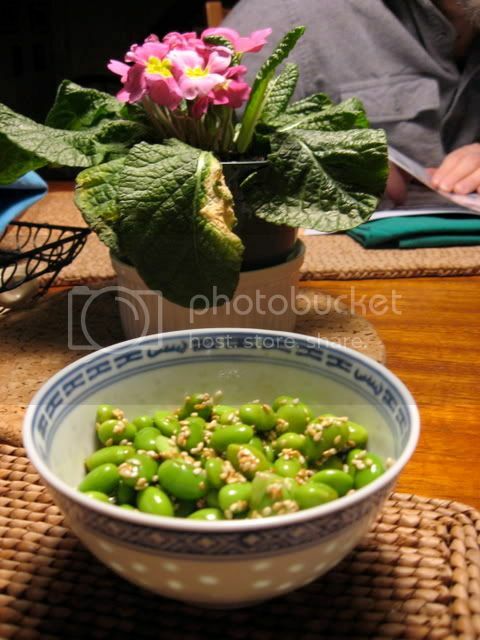 Immediately turn off heat, and remove directly from pan to the top of the edamame. Stir slightly and serve. Changes are afoot around these parts. As anti-diet as I am on principle, I have chosen to embark on a new project - Kicking my major addiction to sugar and high-glycemic carbs. I've chosen to use the South Beach Diet as the framework for doing this. The general idea is that you start with a two week period (Phase 1) without grains, fruit, potatoes, sugar and other high-glycemic and high-carbohydrate foods in order to rebalance the blood sugar and get the body stopping craving high-sugar foods. This phase includes eating 3 meals and 3 snacks a day, with lots of vegetables and beans and lean protein and nuts and good fats. This is followed by Phases 2 and 3 which more or less involve gradually reintroducing whole grains and fruit (and, optionally, occasional small amounts of sugar) into the diet a little at a time until you reach an equilibrium that works for your body - In other words, until you find a way of eating where you're incorporating good carbohydrates into your diet while losing weight and fending off the sugar/bad carb cravings. It's neither low-fat nor low-carbohydrate, yet somehow it has worked for nearly everyone I know who's tried it. So when I made a commitment to losing weight and eating healthier for 2008 (a renewal of my Rosh Hashanah resolution - a second start is the advantage to having two New Years!) I realized this was worth exploring. I want to lose weight, but more than that I want my blood sugar levels to be stable, I want to keep myself from becoming insulin resistant since it runs in my family, and I want to stop craving foods that are addictive to my mind and body and bad for my health. I have always struggled with inability to eat certain foods in moderation - Foods with refined sugar, potatoes, or "white" flours. As a gluten-free eater, "white flour" has taken on a new meaning - I now use that term to mean all the flours that are high-glycemic and/or not made of whole grains, such as tapioca flour, corn starch / flour, white rice flour, and potato starch. I will hopefully be able to find some kind of moderation with these types of ingredients in the future, but I have to start out by eliminating them. I haven't been blogging much because in the past months I have been eating more healthfully and, frankly, I haven't thought that anyone would be interested in reading recipes that aren't gluten-free revisions of traditional gluten-y baked goods and other starchy favorites. The recipes people view on my blog most frequently are my breads and my cakes. The majority of the gluten-free cooks who e-mail me aren't interested in learning how to eat healthier now that they're gluten-free - They want to eat the same way they always did (what is called the "Standard American Diet" [SAD]). They want gluten-free versions of processed, refined, starchy, sugary comfort foods. So for a while I considered calling it a day. But I know that even if my posts on delicious and healthy recipes such as my Quinoa-Cannelini Burgers don't generate the comments or excitement from readers that my old recipes did, there is an audience for healthier gluten-free cooking. I know this from the fact that when I started blogging, most gluten-free bloggers were posting recipes for brownies, breads, and deep fried vittles - Whereas recently I've noticed several other gluten-free bloggers writing about transitioning to healthier ways of eating. I know that I do get e-mails thanking me for posting healthy alternatives. And I also know this blog is not just for my readers, it is for me - A document of the changes and growth in my own eating and cooking. So this is the next chapter in the life of Gluten-Free Bay, and I hope you will join me as I find new ways to approach food. To kick off here is a recipe I whipped up last night when I needed a healthy and filling pareve dish that I could eat with both dairy and meat meals. It's great for Phase 1 of the South Beach Diet. It's vegan, it's nutritious and it's full of spice. The beans and greens are fabulously smoky thanks to the smoked sweet paprika. Best of all, it used up my very last collard green harvest - I dug the last collards out of a pile of snow the other day. There is nothing like harvesting fresh vegetables in the dead of a northeast winter! In a large, heavy-bottomed pot or deep frying pan, heat the olive oil over medium heat. Add the onions and sautee until translucent. Add the garlic and pepper and all of the herbs and spices except the salt. Stirring frequently, cook the spices in the oil for several minutes. Add the collard greens and saute, coating the greens thoroughly in the spices and oil. Sautee for 5 minutes or until the greens begin to wilt. Add all of the remaining ingredients and cover. Turn heat to medium-low and simmer for 30 minutes or until the greens are tender. Stir regularly to make sure ingredients don't stick to the bottom of the pan. Serve hot, as a main dish or a side dish. Can be topped with sour cream, Tofutti Better Than Sour Cream, or vegan cashew sour cream.